The Louisiana Purchase was completed in 1803, more than doubling the size of the United States at a bargain basement cost of 4-cents per acre. The problem was that we had acquired the land mostly to keep other countries from laying claim to it, but then didn’t know what we had purchased. Lewis and Clark set off in 1804 on their two year expedition, and Lt. Zebulon Pike immediately followed with two expeditions, one up the Mississippi River, and a second to the Rockies and the head of the Red River. 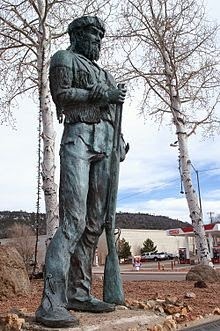 He is little remembered by Americans except for his name being given to Pike’s Peak. By 1820, America had a pretty good idea of the nature of what they had acquired, but men were needed to move west and establish enterprises that actually gave the impression of ownership and control over the territory. These were the Mountain Men. These were usually loners with few family ties. They were trappers and hunters for the most part. Mortality among their numbers was high from starvation, thirst, injury, disease, animal and Indian encounters, and since very few maintained any journals or other writings, most disappeared from the earth without a trace. William Sherley Williams, known to most of his day just as Old Bill, was one of the few exceptions. A few others were Thomas Fitzpatrick, Kit Carson, and Jim Bridger. Williams’ parents had migrated from Western North Carolina to settle on land along the Missouri River near St. Louis, a region then known as the Upper Province of Louisiana. William was born in 1787, and lived closely with the Osage, Delaware, and Shawnee tribes. He particularly related to the Osage, whose language and customs he came to know as well as his own. After leaving home, he became an itinerate preacher, holding camp meetings along his circuit throughout present Missouri. Finding after five years that this was hardly keeping him fed, he settled with the Osage, and resolved to convert them to Christianity. While they enjoyed his Bible stories, conversion didn’t take. In fact, over his life, the trend went more toward the Osage converting Old Bill. He married an Osage wife, the daughter of a chief, received an Osage name, and was adopted by the tribe. The two daughters born to Bill and his wife were left with the tribe when she died, and he left to seek employment. Many trading posts were made or lost by their ability to communicate with the Indians. Trading required not just the ability to know and grade pelts, but to understand the mindset of the Indian. Bill spoke perfect Osage and several other dialects, but it was his understanding of the people that made him so successful and respected. Since fur trading was a seasonal occupation, he also continued his own trapping and hunting. In 1807, President Jefferson promoted William Clark (Lewis & Clark) to brigadier general of the militia of the Louisiana Territory, and U.S. agent for Indian Affairs. In June, 1825, Clark traded the Great and Little Osage nations out of their land rights, creating the surrender of the largest land tracts of any Native American nations in the country. They gave up nearly all their lands in what was the State of Missouri and the Territory of Arkansas. In 1825, Williams was employed by Maj. George C. Sibley as interpreter and guide for the creation of the Santa Fe Trail. Several routes had previously been used for passage west, but the effort here was to establish treaties with all the Indian tribes for a right of passage for public use, especially for settlers, the creation of a marked roadway, and hunting and camping privileges along either side of the route. When this job took Old Bill into the deep West, he never left. He would disappear for extended periods of a year or two, then pop up a couple thousand miles away, yet always appearing available to serve as guide for some of the most important expeditions of the period. Williams became so comfortable in the wilderness that when he returned to Missouri to visit family, he stayed outside and slept on the ground, even in winter, saying a bed was a tool of the devil. For anyone with an interest in history, the exploration and settling of the West, the life of a mountain man, trapper and hunter, or the wilderness, this book is a gem. All the history I’ve referenced above only gets the reader to about page 100, with much more of interest packed in the pages that follow. Be sure to put this book on your reading list. 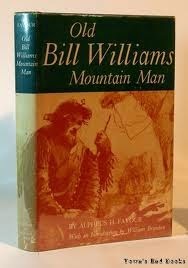 Old Bill Williams: Mountain Man by Alpheum H. Favour, pub by Oklahoma Press, 1936, 211pp.